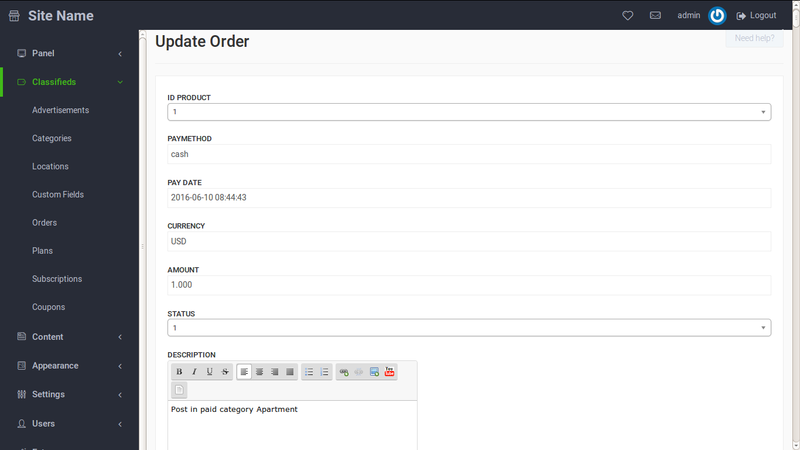 Yclas gives you the option to view and edit the orders made in your website. When orders placed by users, they will appear on Panel, Classifieds -> Orders. Note that only the administrator of the website has access to that area! Here you can view the orders made in your website as well as their details: Status, Product, Amount, User (who placed this order, username - email), Ad, Date (date created), Date Paid. You can also edit these details by clicking the button under Actions on the right of the order. Paymethod: You can change the payment method of this order. Pay Date: In this field you can edit the date user paid. Currency: Which currency is used for this order. Amount: The amount of this order. Txn Id: The transaction id of the payment gateway. How to earn money with your classifieds?